Chirality is a geometric property of some molecules and ions, and a chiral molecule/ion is non-superposable on its mirror image, just like our right and left hands. A number of chiral molecules can be found in the world of chemistry, while their constituting atoms and alignment are the same. Enantiomers, which are chiral molecules, have similar chemical and physical characteristics but their biological functions, if any, are very different one another. For example, out of a pair of chiral molecules, one enantiomer may show an excellent pharmaceutical/medical activity while the other enantiomer may exert an adverse effect. Thus, developing a chemical synthesis reaction that selectively produces one enantiomer of chiral molecules useful in medicine is of great significance in the synthesis of drugs and their precursors. Chiral hydroxycarbanions*1) are important in the asymmetric synthesis of chiral molecules. However, the conventional method for synthesizing a hydroxycarbanion requires a preparatory procedure consisting of multistep operations using metal reagents, the reactivity of which is difficult to control (Figure 1). A research team at Kanazawa University has developed a new method of catalytic synthesis of chiral hydroxycarbanions from aldehydes and, by taking advantage of this, developed a new reaction protocol for asymmetric synthesis. 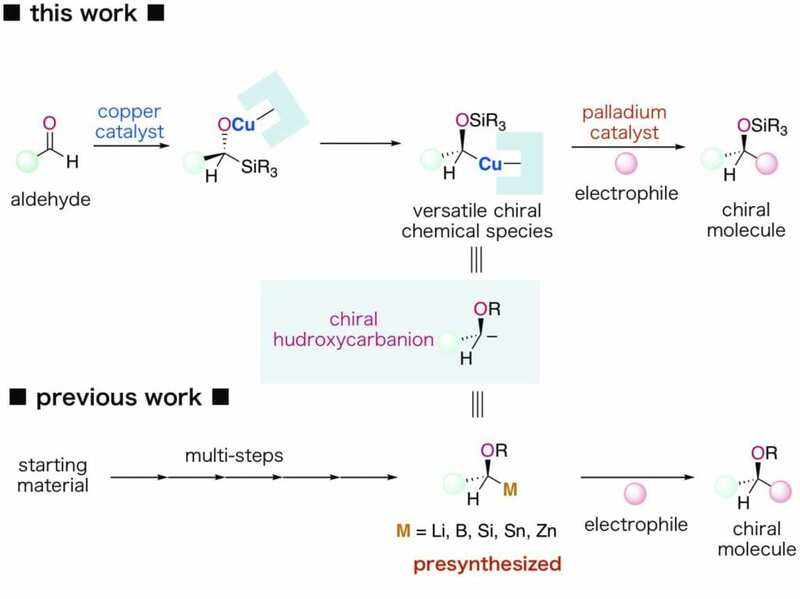 More specifically, the group has designed a hybrid catalysis system consisting of a copper catalyst and a palladium catalyst in a synergistic manner, which enables the following processes, (i) and (ii) below, to take place in one flask while maintaining chirality information at the individual steps (Figure 1). As a ligand*2) for the copper catalyst, a newly designed chiral N-heterocyclic carbene*3) was found to be effective (Figure 2). It was revealed that this carbene plays important roles in catalytic activities, regulation of the reaction and enantioselectivity. (i) A chiral copper species that is a chiral hydroxycarbanion equivalent is catalytically formed from an aldehyde through asymmetric silylation of the aldehyde and rearrangement reaction in a flask. (ii) The chiral copper species thus formed in the flask is captured with an electrophile*4) in the presence of a palladium catalyst. By the newly developed protocol, chiral biphenylmethanol that is an important basic structure in drugs such as anti-histamines and in drug candidate chemicals can be synthesized through the reaction of an aromatic aldehyde and a bromobenzene (Figure 3). A carbanion is a chemical species in which carbon bears a negative charge. A ligand is an organic molecule that binds to a central metal atom. A carbene is a twofold coordination chemical species containing a neutral carbon atom with only six valence electrons. An electrophile is a chemical species that accepts an electron(s) in a chemical reaction.